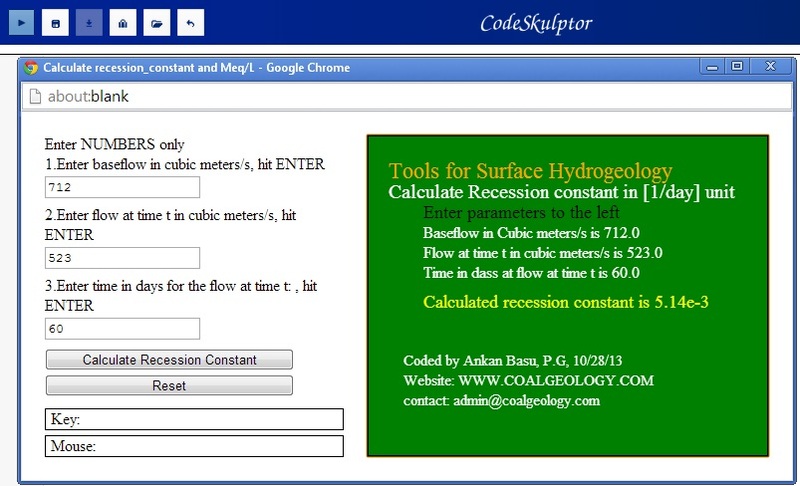 Today I am going to show you another computer application in hydrogeology, more specifically – in surface hydrogeology. In many projects, it is crucial to monitor flow. Flow generally varies over time and respond to rainfall events. It also varies depending on the season. For many engineering applications, it is important to establish the base flow at a station of interest. If a dedicated rainfall-station not available at the project area, we use freely available weather station data for the closest nationally established station. For some application, we need to determine recession constant after a rainfall event has occurred. There are some great papers and lab work that you can use to review the concept of recession constant. In short, the decline is similar to exponential decay of a radioactive atom. The best selling book, Applied Hydrogeology by C.W. Fetter has an in-depth coverage of the base flow and recession constant in chapter two. Today, I will make your job simple by presenting a web based GUI application that you can use to calculate the recession constant online. The application that I have developed in coded in Python and you are free to use and distribute the program to anyone you like. note: photo says to enter the “base flow”. I have edited it later. It should be PEAKFLOW. The GUI screen I have presented actually used input parameters from a problem from Fetter Hydro Book on chapter 2. (Problem 9). He stated that the river has a flow at the start of a baseflow recession as 712 cubic meter/s; after 60 days, the flow reduced to 523 cubic meter/s. What is the recession constant? Using our tool, we determine that the recession constant is 5.14 E-3 /day. For advanced users: Debug the code for yourself! #can be used to solve hydrogeology problems from various text books.